Christian giving is not primarily about balancing the books of the Church, it is about resourcing God’s work, resourcing God's mission, which every Christian is called to join in. Are people excited about what your church is doing? Are they motivated to give to God’s work in the local community and your vision for the Church? The giving of money is an essential ingredient of Christian discipleship. Discipleship which excludes graceful giving is diminished. Our giving is also a reflection of our love of God and an expression of our gratitude for His most precious gift, ‘the redemption of the world by our Lord Jesus Christ.' “For God so loved the world that he gave his only Son so that everyone who believes in him may not perish but may have eternal life” (John 3: 16). 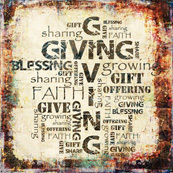 Giving is a spiritual issue which goes to the heart of being a Christian. Christian giving is an expression of the grace of God. Leaving a Gift in your will to the Church is a practical way of saying "Thank you" to God for all the blessings we have enjoyed during our lives. The idea behind a Parish Giving Officer network is to have someone in each parish or benefice who will assist in promoting giving and raise the issue of stewardship and have been established in many dioceses.